Alternative H1 is almost identical to Alternative G2. The primary difference is the configuration of Ramps B and C. Ramps B and C exit from I-295 from the right. 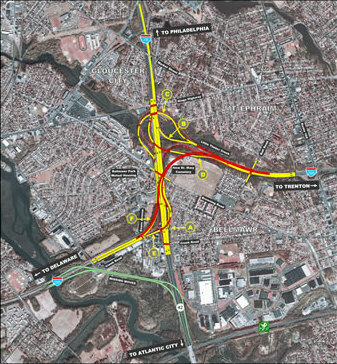 Ramp C generally follows (within 150'±) the existing Ramp C alignment (Al Jo's curve) and passes under I-76 and Ramp F before merging with Route 42 southbound. The substandard radius on the existing Ramp C is replaced with a larger radius. Ramp B splits from Ramp C to meet I-76 northbound.